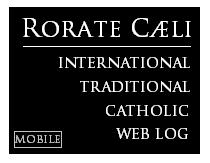 RORATE CÆLI: Compiègne: "To the poorest daughter of Carmel,honor speaks louder than fear." honor speaks louder than fear." 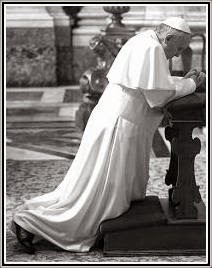 Mother Marie: You have the power to force me to silence, but none to command me to it. I represent here the Reverend Mother Prioress and I shall take no orders from you. A Commissary: Confounded old hag! She cannot be made to hold her tongue, fellow Citizen, but remind her that the Republic has a machine at its disposal that will leave her somewhat short of breath! First Commissary: Enough! I repeat that you must behave as a true representative of the people! [He turns to Sister Blanche:] Young citizen, you have nothing to fear from us, who are your liberators! Say but one word, and you will find yourself beyond the sway of those who, to better put you in their power, have not feared to offend nature in usurping even the sacred name of "mother". Henceforth, you are under the protection of the Law. Mother Marie: But she is first under my protection. Do you think I shall permit you to take any further advantage of the terror of a child? I shall take great care to avoid a language that you cannot understand. You know nothing of that which holds us here and keeps us united unto death - or, if once you knew it, it is now certainly forgotten. But there are still perhaps words which are common to us, and which can touch your conscience. Well, sir, you must know that to the poorest daughter of Carmel, honor speaks louder than fear. On the day following her feast, the Blessed Virgin of Mount Carmel would receive her dear French daughters, martyred for their faith in her Son and for their loyalty to His Church. 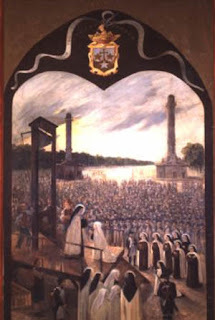 O glorious Martyrs of Compiègne, pray for us!